Cute and easy DIY Halloween Costumes! Don’t even try and pretend you haven’t been waiting all year for Halloween to finally come around. The candy, pumpkin flavored everything, haunted houses, watching Hocus Pocus for the millionth time, I can’t not think of reasons why I love it. The best way to enjoy all of it of course, is by sporting the coolest Halloween costume. A good costume needs to be clever, easy to put together, and have the greatest potential for a sweet ‘gram. We’ve collected some of our favorite classy Halloween costumes for you to choose from. Some of the cutest and simplest costumes come in animal form. We love the fun colors and make up possibilities, and it usually only takes one or two well placed accessories to get your point across. Our Easy Bunny Costume is so classic. You probably already have a set of bunny ears hiding away in your Easter stuff somewhere. The rest pretty much puts itself together. We’ve all got millennium pink in our closets somewhere by now. This Flamingo Costume is so simple and costs just a few pennies. Nothing says Halloween Costume like a classic black spider. Put that old black hoodie in your closet to work for this Spider Costume. I love how easy this Wise Old Owl Costume is from Emmy in the Making. Use an old pair of glasses to make these cute little masks, and then all you need is brown or grey clothes for the rest! It’s crazy easy. You’re going to go baaahhzerk for this cute sheep costume! 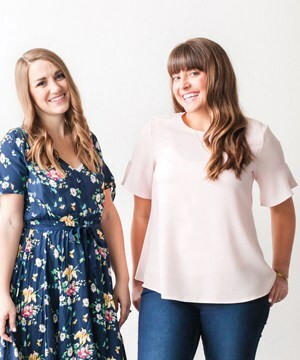 The Joy of Fashion lays out every step for you (it involves a LOT of cotton balls) so you can DIY to your heart’s content. This last one isn’t technically an animal, but stay with me, it does involve them.You can’t really get much more Halloween than an Alfred Hitchcock Movie, and “The Birds”is one of his best! Get yourself a vintage dress, (did someone say thrift shopping?) a 60s inspired do, and a couple of fake crows, and some sunnies, and you can recreate this amazing “The Birds” costume brought to you by Andrea’s Notebook. Nothing brings a couple closer than dressing up together and pretending to be something or someone else. Get yourself a significant other or a bestie so you can try out a few of these gems. If you are blessed to have a warm Halloween this Pool Boy and Drink Costume is such a cool way to go! 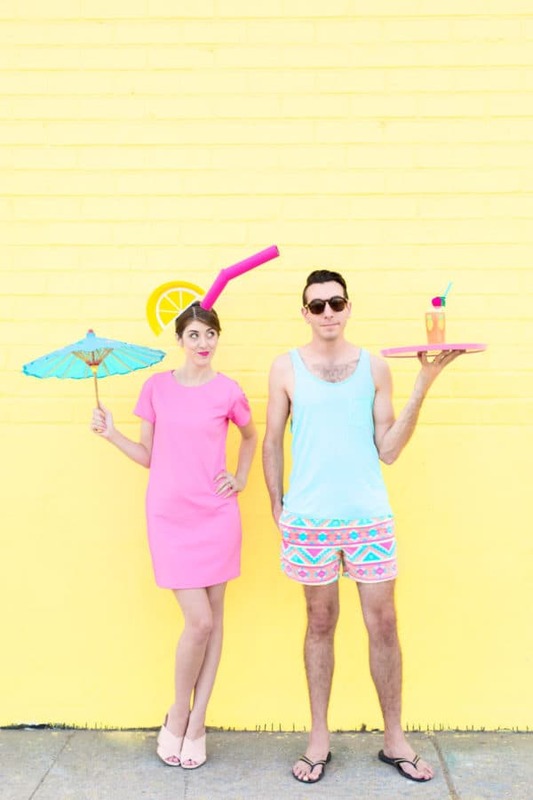 DIY studio has shown how effortless it can be to have an awesome costume with your partner. “There’s nothing wrong with having a tree as a friend” –Bob Ross. Turn the dreams in your heart into art all around you with this adorable Bob Ross and His Happy Little Tree costume. Turn cact-i into cact-US! This Couples Cactus Costume from Brit.co is so adorable! And incrediblyeasy. If you’ve got a green sweater, you’re already halfway there. I don’t know if I can think of a better pair than A Cookie and the Milk Man. 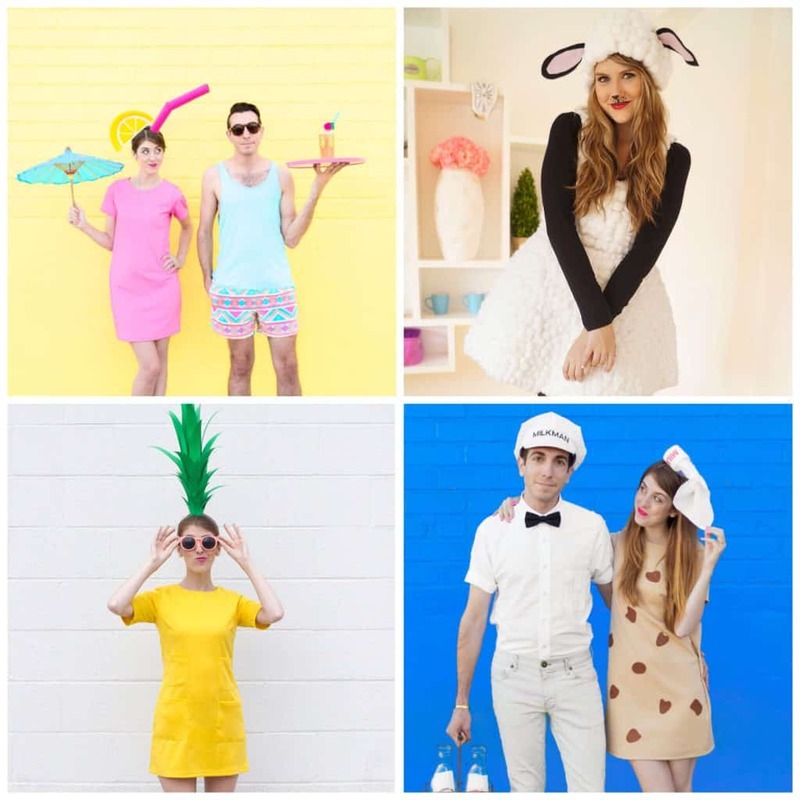 DIY studio has shown how you can whip these costumes up in no time. I love how easy this Party Animals Costume from Brit.co is. All you need is to be dressed to the 9s, and an animal mask or even just ears! It seems to me like a really good excuse to buy a fancy party dress I probably don’t need. Isn’t that what Halloween costumes are really all about anyway? We all know some of the best costumes are the clever punny ones. We might not have the money to get Heidi Klum level halloween costumes every year, but it doesn’t cost a thing to have a clever idea that gets everyone we see on all Hallows eve smiling. Brit.co has heaps of fun things to do with a simple striped shirt, but my favorite is the Jail Bird Costume. It’s basically a striped shirt and some over the top winged eye liner. If you’re feeling crafty you can throw in a set of DIY wings. Taco Bell(e). Listen to this, get a yellow dress (go as fancy as you want to make it, or not) a rose, and a box of tacos! Delish has given me my favorite excuse to buy tacos and carry them around with me all night. What’s not to love? When life gives you lemons….write life on your shirt and carry lemons around with you all night for a clever and stress free costume. This idea for Life Giving Lemons costume from Buzzfeed is so awesome and easy. I can not get over this one. Put a “bless you” on your shirt, and a classic “disguise” pair of groucho glasses, and you’ll be….wait for it… a Blessing in Disguise. I love this idea from the Thinking Closet. Am I the only one who thinks about food like, all the time? Besides all the wonderful things you can eat on Halloween, you also get to DRESS UP as some of your favorite foods! Here are some of our favorite food halloween costumes. Sushi!! The Chungry Girl makes this sushi costume look so easy! It’s basically a white dress/jumpsuit/whatever you have with a salmon coloured pillow plus a few extra pieces of fabric. Guys, we can dress up like Chipotle. 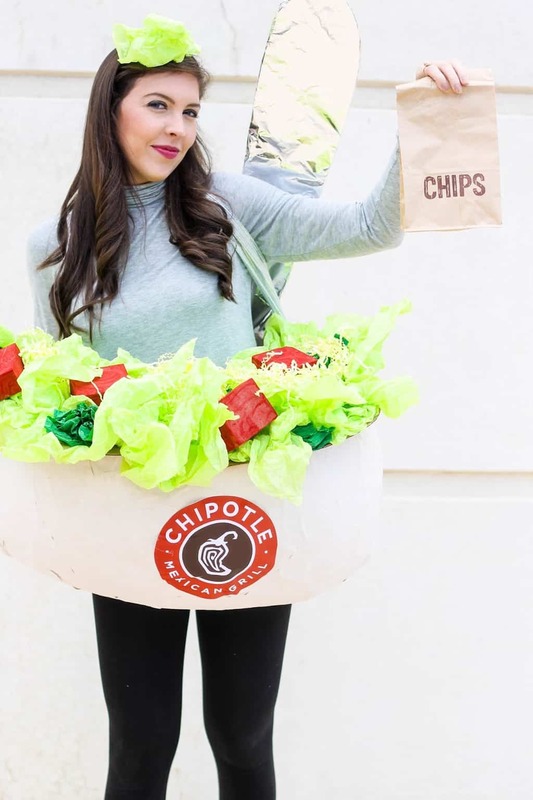 That’s a thing, A CHIPOTLE COSTUME. Am I a bad person for wanting to make this costume just in the hopes I can get free chipotle out of it? I feel like it would work like 74% of the time. That alone is worth it. You have to look at this adorable Gumball Machine Costume. Get a glue gun, bag of pompoms, and a red skirt and you are good to go! The Joy of Fashion has made this so simple. I’m sorry, I gotta do another Bubble Gum Costume, this one’s from Studio DIY. But this one is so simple! Everyone has a millennium pink dress or skirt by now right? Add some pink balloons and you are the cutest piece of bubble gum anyone has ever seen. If we could nominate a fruit of the year, it would probably be the pineapple for 2018. This cute Pineapple costume from DIY Studio is so easy to put together. Sriracha is like fairy dust. You can put it on pretty much anything and it will be delicious. You might not be able to taste anything else, but it will definitely turn into spicy deliciousness. This Sriracha costume is so easy if you have a Cricut or Silhouette machine (Don’t worry, if you don’t Sarah Hearts offers a couple alternatives). Is it weird I kinda just want one of these shirts to wear all the time? You’re sure to have a *poppin* Halloween with this adorable Popcorn Costume. Studio DIY has been so creative with this simple food lovin outfit. It’s really a shame Halloween only lasts for one night. I always try and book as many events as I can around Halloween so I have as many excuses to wear as many costumes as possible. What are you going to be this year?